California Newsreel - educational video documentaries and films on African American life and history, Civil Rights History, Africa, race and diversity training, media and society, campus life, labor and workplace issues. In 1950, Gordon Parks – one of the most celebrated African American photographers – returned home to Fort Scott, Kansas to track down his old schoolmates and show the impact of segregation. These civil-rights era photographs show that segregation was never completely black and white. Throughout 2014, Colorlines is examing the structural inequities that shape the lives of black men. Too often, we zero in on black men only at thier point of premature death. The protests against police shootings are a referendum on the black condition since the Great Migration. Racism is a lot of things — cancerous, insidious, learned, dangerous, destructive, dumb, vicious, institutional — but not accidental. By M.K. Asante. From the time of slavery, some light-skinned African-Americans escaped racism by passing as white. The new book, A Chosen Exile: A History of Racial Passing in American Life, explores what they lost. BANISHED tells the story of three counties that violently expelled African American families from their towns a century ago--and the descendants that return to learn a shocking history. The Tulsa race riot was a large-scale, racially motivated conflict on May 31 and June 1, 1921, in which a group of white people attacked the black community of Tulsa, Oklahoma. It resulted in the Greenwood District, also known as ' the Black Wall Street' and the wealthiest black community in the United States, being burned to the ground. All of us were shocked by the scenes of police cars being rocked and burned and rioters on the street, of St. Louis County businesses being looted and left in smoking heaps. However, go back to the same city nearly a hundred years before and we see a very different story. When Oregon was granted statehood in 1859, it was the only state in the Union admitted with a constitution that forbade black people from living, working, or owning property there. 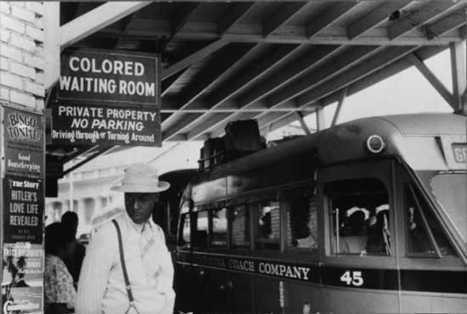 It was illegal for black people even to move to the state until 1926. Jesse Washington was just one black man to die horribly at the hands of white death squads. The United States practiced a unique cultural ritual that was as least as gruesome as the "medieval" punishments meted out by ISIS against its foes. A new report aims to force Southern towns and the nation to confront an era of racial terror directly and recognize its ramifications today. You can tell a lot about a nation by the sociological data it chronically underreports. The following is a summary & analysis of Harvard Civil Rights-Civil Liberties Law Review article, “Law of the Noose: A History of Latino Lynching” by Richard Delgado. The Civil Rights Restorative Justice Project wants to document every racially motivated killing in the American South between 1930 and 1970. The project's director says it's a race against the clock. We don’t have a chance of benefiting from history if we neither know nor acknowledge it. WALLACE, La. – Life-size sculptures of slave children haunt the clapboard church on the grounds of the old sugar cane plantation, where ceramic heads of black men will soon sway on pikes in the Louisiana breeze. Now Katrina Browne urges Americans to explore their own roots. Edward E. Baptist’s “The Half Has Never Been Told: Slavery and the Making of American Capitalism” makes the argument that slavery was central to much of this country’s economic development. Many of the modern-day practices of our free-market capitalist system are at least partly responsible for the oppression of black people in America. What Does 'Sold Down The River' Really Mean? The Answer Isn't Pretty. The phrase 'sold down the river' means you've been betrayed. It used to mean something far worse. "River" was a literal reference to the Mississippi or Ohio rivers. For much of the first half of the nineteenth century, Louisville, Ky., was one of the largest slave trading marketplaces in the country. Slaves would be taken to Louisville to be "sold down the river" and transported to the cotton plantations in states further south. In his 2010 history of the Mississippi River, journalist Lee Sandlin said that "the threat of being 'sold down the river' was seen as tantamount to a death sentence." The Shores family, near Westerville, Neb., in 1887. Jerry Shores was one of a number of former slaves to settle in Custer County. We spend the hour with the author of a new book, 10 years in the making, that examines how many major U.S. universities — Harvard, Yale, Princeton, Brown, Dartmouth, Rutgers, Williams and the University of North Carolina, among others — are drenched in the sweat, and sometimes the blood, of Africans brought to the United States as slaves. In "Ebony & Ivy: Race, Slavery, and the Troubled History of America’s Universities," Massachusetts Institute of Technology American history professor Craig Steven Wilder reveals how the slave economy and higher education grew up together. "When you think about the colonial world, until the American Revolution, there is only one college in the South, William & Mary ... The other eight colleges were all Northern schools, and they’re actually located in key sites, for the most part, of the merchant economy where the slave traders had come to power and rose as the financial and intellectual backers of new culture of the colonies," Wilder says. In an interview, author Craig Steve Wilder discusses how many major U.S. universities are drenched in the sweat and blood of people brought to the U.S. as slaves. Race and Membership in American History: The Eugenics Movement (ISBN 9780961584191) focuses on a time in the early 1900s when many people believed that some "races," classes, and individuals were superior to others. from Stay Free!, a magazine focussed on American media and consumer culture"Imagine yourself in the heart of Kansas, at the annual state fair, in 1928. Past the dunking booth and Ferris wheel, the stands selling corn dogs and cotton candy, farmers from around the state have gathered to show off the year's yields. Amid the horses, cattle, and hogs, a blue-eyed blonde family of four is displayed on an elevated platform. Over their heads is a large banner: fitter families contest....."
Islands overrun by flawed people, both indigenous and imperialist. In James L. Haley’s ’Captive Paradise,’ a compelling warts-and-all history of Hawaii’s era of independence. Congress passed a measure that would give lands sacred to Native Americans in Arizona to a foreign company. The U.S. government operated 100 boarding schools for American Indians on and off reservations. 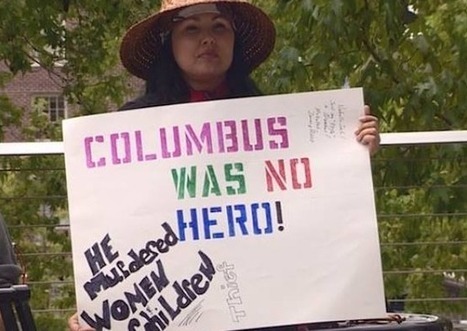 One expert says the schools were part of a strategy to conquer Indians. Students who attended them were required to talk and dress as mainstream Americans. General Terry, General Harney, General Sherman, Arapaho squaw, General Sanborn, Colonel Tappan, and General Augur, 1868. Author Roxanne Dunbar-Ortiz speaks about her book on the true history of how the United States became a nation and Eurocentric racism that justified it. The real story of Christopher Columbus. During my school years, and perhaps during yours, whenever October rolled around, we started learning about the ‘great explorer and discoverer of America,’ Christopher Columbus. The Rev. Junipero Serra, a pious preacher from the late 1700s whom the pope plans to canonize, is accused by Indian historians of cultural sabotage. The sons and daughters of American servicemen and their Japanese wives recall the tales their parents told them about adjusting to life in the U.S. in the postwar years. Sunday marked the 50th anniversary of the bombing of the Sixteenth Street Baptist Church in Birmingham, Alabama, a watershed moment in the civil rights movement. On Sept.
-- Deep in the mountains of northern Idaho, miles from the nearest town, lies evidence of a little-known portion of a shameful chapter of American history. Can the Church of Latter-day Saints accept its racist history?